Accra, Nov. 11, GNA - President John Agyekum Kufuor on Thursday signed a Book of Condolence in honour of the Palestinian leader Yasser Arafat at the Embassy of the State of Palestine in Accra. In brief remarks President Kufuor said: "It is a sad day today, for the world has lost one of its very remarkable leaders. "Arafat lived his entire life for the people of Palestine to satisfy his vision, aspirations and success of the future of the State of Palestine." President Kufuor said although not everybody understood him he lived all his adult life in the full glare of the world and worked as a patriot saint for his nation. He said world history would not be complete without Arafat although the Middle East politics had been complex in the scheme of world politics. "History will give him a glorious honour while his opponents feel sad that he has left the scene", he said. President Kufuor said: "Ghana is mourning with the people of Palestine on the death of this great man, who has left a mark of nationalism for his people." Arafat 75, died at dawn on Thursday, November 11 at the Percy Military Hospital at Clamart, France where he had been on admission since October 29. 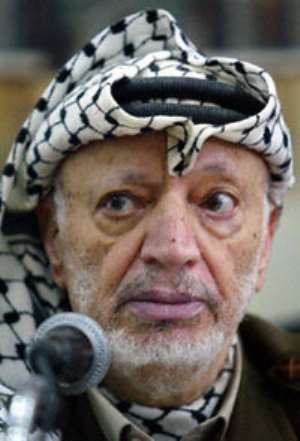 The Palestinian Authority has declared a 40-day period of mourning across the Palestinian territories to mark the death of the veteran leader Arafat. Private businesses are to close for three days and public institutions for seven days, but a general mourning will last for 40 days during which flags would remain at half-mast and all festivals would be cancelled. Nana Addo Dankwa Akufo-Addo, Minister of Foreign Affairs and Mr Ibrahim Khalil Omar, Ambassador of the State of Palestine and Dean of the Diplomatic Corps in Ghana witnessed the signing of the Book of condolence.